Apple rumoured to be getting Hollywood films on iTunes just two weeks after release | What Hi-Fi? According to a report from Bloomberg, which cites "people with knowledge of the matter", Apple is in talks with a number of Hollywood studios in order to get priority access to movies. 21st Century Fox, Warner Bros. and Universal Pictures have confirmed they are considering allowing home rentals of films as soon as two weeks after they have been released in cinemas. 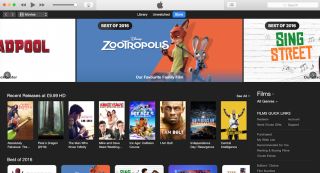 A deal with iTunes is one option for distributing recent films - however it's likely these will come at a premium price, possibly between $25-$50 (approximately £20-£40). It's unclear at present what resolution these films would be delivered in. Most cinema projectors are either 2K or 4K compatible; iTunes films are currently available at a 720p or 1080p resolution, with 5.1 Dolby sound. In contrast, Google has recently added 4K films on its Play store, for those in the US and Canada.